Stars and Stripes gives us a report on COP Michigan after the abandonment of the Korengal Valley. For years, U.S. forces struggled in vain to win over the Korengal, so insular and violent that its people defeated an entire Russian division. Finally, on April 14, the 2nd Battalion, 12th Infantry Regiment of the 4th Infantry Division packed up their items and pulled the U.S. presence back to COP Michigan. The 327’s 1st Battalion took over six weeks later. Michigan is attacked so frequently now that soldiers at the other three Pech River Valley bases, who all have heavy fights on their hands, grimace when they hear that Michigan is a visitor’s destination. In most places in Afghanistan, soldiers who stay inside the wire, meaning behind the base walls, are usually considered on safer ground. At Michigan, “sometimes guys feel like they are safer outside the wire,” said Capt. Dakota Steedsman, commander of Company D.
Soldiers spend 80 percent of their time just defending the base or reacting to attacks from the surrounding mountain walls, a far cry from the focus on counterinsurgency and governance in other parts of the country. Another enlightening report from Stars and Stripes comes to us concerning use of the big guns in the Pech River Valley area. 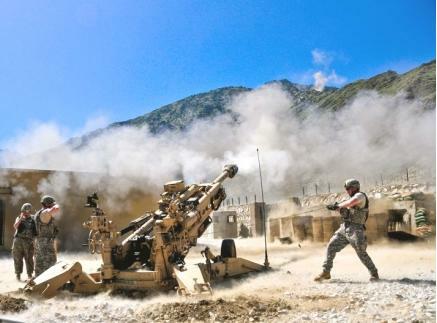 Each day in this hot summer fighting season, the thundering boom of U.S. artillery reverberates off mountain walls, shaking the Pech River Valley like a giant’s footsteps. The big guns at Camp Blessing, the 1st Battalion, 327th Infantry Regiment’s headquarters in the river valley, fire when any of the four U.S. bases that dot the river road come under attack. They strike when soldiers on patrol are ambushed by insurgents who stalk them from the mountain ridges, or when there are reports of insurgents preparing an assault. In most of Afghanistan, the counterinsurgency strategy of diplomacy and governance has made these 155 mm howitzer guns almost irrelevant. Most artillery and mortar men are doing infantry jobs, focused on key population centers. Not so in Pech. This is an artillery fight here, in deeply hostile mountain terrain, and this fighting season is so extreme that there is near constant and imminent threat to soldiers holding the valley floor. It’s obvious that there are TIC (troops in contact) in the Pech River Valley, and it’s also obvious that there are plenty of insurgents in the area. Friend Joshua Foust, with whom I seldom disagree, argued for leaving the rural, isolated areas in favor of heavy force projection in the heavily populated areas, a strategy that was and is being employed by the administration in a tip of the hat to population-centric counterinsurgency. I’m worried that there is a fundamental misunderstanding of the nature of the Afghan insurgency at all levels. It isn’t an urban based insurgency. Dense population centers are not the centers of gravity that they are/were in Iraq or other insurgent movements. Because it is a rural insurgency, counterinsurgents must need be in rural areas with the population, which by extension means that we run the risk of spreading our forces thin. There’s always risk. If it’s no longer worth the risk to put forces in the decisive points where they need to be in order to defeat the insurgent momentum, then it’s no longer worth the risk to be in the theater of operations at all. I highly disagree with that too. Just so. While I slightly to moderately disagree with the controlling concept of CoG for warfare, I certainly strongly disagree with the notion of the singular CoG being the population, even in counterinsurgency. This isn’t to say that the population isn’t important, or that we mustn’t work with them, or have no need of living with them, contacting them, or protecting them from insurgents. It is to say, however, that for us to win based on population approval is the same thing as occupation of land, just with a different target. While Joshua also seems to disagree with what he called the “Baghdadification” of Kandahar (a tip of the hat to zones, concrete barriers, etc. ), at least that focuses on corralling and killing the enemy. In Fallujah in 2007 heavy kinetic operations were employed to kill the enemy, along with concrete barriers, gated communities, biometrics, and so on to identify the enemy. If this sounds different from the popular narrative, it’s because it is. Gated communities and biometrics weren’t employed to protect the population. They were employed to locate and destroy the enemy. Nuristan and Kunar are worth it because this is the lifeblood of the insurgency. But a strong warning goes along with this advocacy. If we are setting our troops up for the same fate as the men at Wanat or Kamdesh because of lack of CAS, lack of logistics, under-resourcing, lack of artillery and restrictive ROE, then we should withdraw them now. Counterinsurgency isn’t a game to be played out of anthropological textbooks. Real lives are at stake, and unless we are willing to commit the resources, it’s easy (and perhaps wise?) to pose the question as Josh does – is it worth it?